YEREVAN (A.W. )— The Armenian Revolutionary Federation (ARF) supported Armenia’s new constitution and must now take part in trying to implement it to ensure internal stability and development in the country, according to ARF Bureau representative Hrant Markarian. 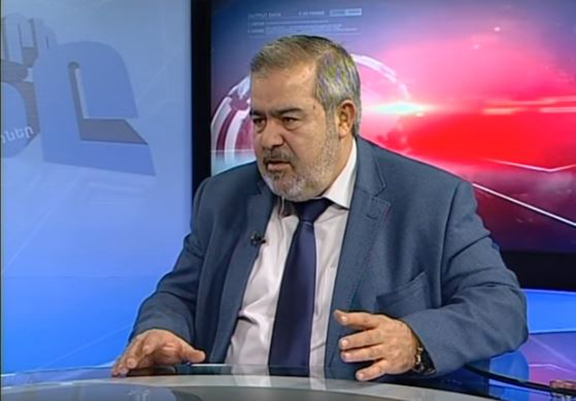 “We [the ARF] cannot stand aside—we must take part,” Markarian said in an interview with Armenia’s Yerkir Media Television’s “Yerkri Hartse” program on Jan. 21. During the interview, Markarian explained that the ARF has started talks with Armenia’s President Serge Sarkisian, to formulate a plan for collaboration in making the new constitution a reality in Armenia. “The offer came from the President, and based on that proposal we have engaged in initial conversations…We have not yet entered the phase of negotiations,” Markarian said, when asked if the ARF was preparing to enter into a political coalition with the ruling Republican Party of Armenia (RPA). “For the past seven years there have been several rumors that the ARF will re-enter a coalition. We have continuously responded to these rumors by saying they are not true. And now that we are in talks [with the President], we wanted to make sure to notify the public about it, so that people will realize that we are truly open and transparent; that we are not a party that hides the facts and plays politics behind the curtain,” Markarian said. According to Markarian, there have been several new developments since the ARF left the ruling coalition in 2009, including the adoption of the Pan-Armenian Declaration on the Centennial of the Armenian Genocide and the approval of the new constitution, for which, according to Markarian, the ARF was the leading advocate. “Many things have changed, and I believe that we are at a new starting point in terms of development in the country. I have always believed that if we truly work hard and if all political forces—those in power and in opposition—have a positive approach, Armenia could quickly get on track for real development,” he said. “We know well that [political] coalitions will have true meaning only after 2017 [Parliamentary elections]. It is likely that there will be a situation when the parties will need to employ that mechanism of bilateral cooperation. It is at that time that a coalition is indeed real and can be effective. Today, we are not in that situation; we have not even begun thinking whether or not we will enter a coalition. Like I said, [the conversation] is really in its early, initial phase,” Markarian explained in his Jan. 21 interview. The ARF left the ruling coalition in 2009. Markarian went on to say that by making the new constitution a reality, the ARF will try to help bring change to the country. “There is a lot of work to do—both as an opposition and as a ruling authority—and in both cases the ARF strives for real change. We have not been a part of the ruling coalition for the past seven years, but we have collaborated with the government on certain issues, such as the Nagorno-Karabagh issue, the genocide issue—we have worked together and there is no reason to be embarrassed by that. When we work on issues such as Nagorno-Karabagh, it has nothing to do with the ruling regime. It is our homeland, our country. We [political forces] will all vanish one day, but the country, this nation, and its people will always remain,” Markarian said. Markarian also noted that failures and shortcomings belonged to all political forces in the country. “If the situation in the country is bad, and if I—as opposition—cannot help the situation get better, am I not guilty? If I am part of the ruling party, and I am not allowing the situation to get better, I am doubly as guilty. In both cases, I am guilty. I think that whatever happens in the Armenian reality, the ARF is responsible,” he said. When asked about the ARF’s tenure in the ruling coalition, Markarian said that he believed the situation was better and the party played a more positive role when it was part of the ruling coalition. “We [the ARF] had a more positive role. I think that if you are being honest with yourself, you’ll have to admit that we were able to somewhat change the environment—I don’t mean entirely. The restraints and impediments were too many. But considering our size, we were able to play a role, nonetheless,” said Markarian. “Where the interests of our homeland are concerned, there is a national issue, and we must all be able to work together. That is especially true when we have clashes on the external front—we need collaboration and unity,” said Markarian. Armenia’s National Assembly approved the proposed package of constitutional reforms, which call for a shift from a semi-presidential to a parliamentary form of government on Oct. 5, 2015. The ARF has supported and promoted a parliamentary system of government in Armenia since independence. Under the new system, Armenia would work with a 101-seat parliament with a 5-year term elected entirely by proportional representation. Under the current system of government, there are 131 members of parliament, with 41 elected in first-past-the-post constituencies and the rest by proportional representation.